Does our microbiome cause inflammaging, the low-level chronic inflammation that plagues our bodies as we get older? A new research paper examines the question, and their findings just might surprise you. Many people still regard bacteria and other microorganisms as mere disease-causing germs. However, it’s a lot more complicated than that. In fact, it has become increasingly clear that a healthy human body is teeming with microbes, which play a role in our immune system. We are not just an organism; we are a super-organism and the millions of microbes both within and without our bodies. Geroscientists are starting to realize that the human microbiome, the colony of bacteria in our gut, Several studies have shown that our microbiome changes as we age, and this could negatively impact our health. Our microbiome changes with aging. Inflammaging is a shorthand term for the ‘chronic low-level inflammation brought on by old age.’ Our immune system protects us again pathogens. Inflammaging occurs because the immune system which protects us in our youth turns against us in our old age and forgets to turn off the inflammation response. This leads to low-level chronic inflammation associated with old age known as inflammaging. While geroscientists are not exactly sure what causes inflammaging, an emerging hypothesis is that chronic inflammation is caused, in part, by age-related to changes in the microbiome, or due to gut leakage. 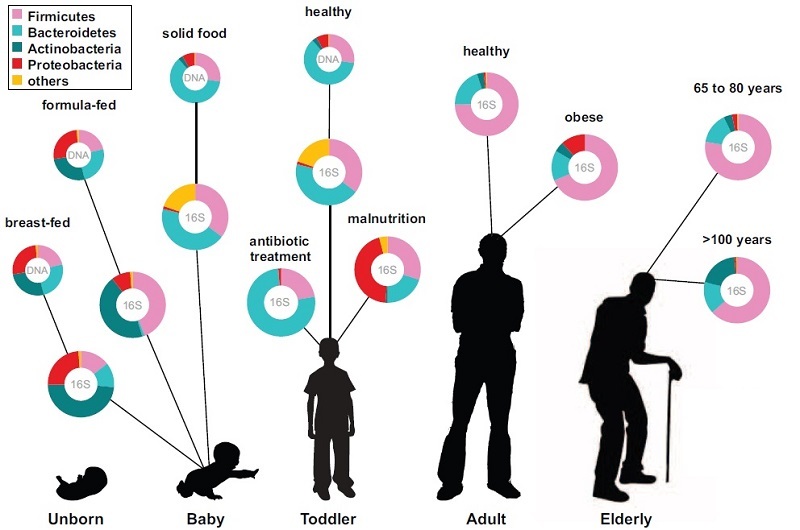 As the figure above shows, our microbiome changes with age. While geroscientists have to show that a sick microbiome causes inflammaging or chronic disease, they have strong suspicions. Does Our Microbiome Cause Inflammaging? The Israeli geroscientists are not the only ones setting their sites on the microbiome. A host of organizations, from the U.S. Government to IBM, are investigating the microbiome’s role in human disease. Even search giant Google’s life sciences arm Verily announced they are getting into the microbiome act. These firms will leverage the groundwork laid by the NIH’s 5-year, Human Microbiome Project. IBM, in particular, is hoping that their study of the microbiome will shed light on will shed light on auto-inflammatory conditions such as type 1 diabetes, Crohn’s disease, Hashimoto’s, and ulcerative colitis. As part of their study of the microbiome, IBM announced they would analyze millions of microbial genes, starting with those belonging to bacteria in our gut. It’s not clear if the microbiome plays a role in inflammaging, and even if it does, it is not the only source of chronic inflammation. On the other hand, scientists, have found more likely sources of inflammaging. Geroscientists have implicated garb-aging and protein cross-linking and most notably senescent cells, as sources of chronic inflammation. There are many likely sources of this age-related malady. In fact, a recent comprehensive report lists all the known causes of inflammaging. Related: These gut bacteria fuel to autoimmune disease. Related: Scientists discover these bacteria ward off skin cancer. Cover Photo Credit: Darryl Leja, NHGRI. Maayan Levy, Aleksandra A. Kolodziejczyk, Christoph A. Thaiss & Eran Elinav. Dysbiosis and the immune system. Nature Reviews Immunology 17, 219–232 (2017) doi:10.1038/nri.2017.7. Published online 06 March 2017. Michelle G. Rooks & Wendy S. Garrett. Gut microbiota, metabolites and host immunity. Nature Reviews Immunology 16, 341–352 (2016) doi:10.1038/nri.2016.42. Published online 27 May 2016. Please share this post and help us spread the word. All it takes is one simple click on any of the social media links on this page. Diagnosis, Treatment, and Advice: This article is intended for educational and informational purposes only and is not a substitute for professional medical advice. The information and opinions provided herein should not be used during any medical emergency or for the diagnosis or treatment of any medical condition. Experimental therapies carry a much higher risk than FDA-approved ones. Consult a licensed and qualified physician for the diagnosis and treatment of any and all medical conditions. Call 911, or the equivalent emergency hotline number, for all medical emergencies. As well, consult a licensed physician before changing your diet, supplement or exercise programs. Photos, Endorsements, & External Links: This article is not intended to endorse organization, companies, or their products. Links to external websites, mention or depiction of company names or brands, are intended for illustration only and do not constitute endorsements.